Green in early modern England did not mean what it does today; but what did it mean? Unveiling various versions and interpretations of green, this book offers a cultural history of a color that illuminates the distinctive valences greenness possessed in early modern culture. While treating green as a panacea for anything from sore eyes to sick minds, early moderns also perceived verdure as responsive to their verse, sympathetic to their sufferings, and endowed with surprising powers of animation. Author Leah Knight explores the physical and figurative potentials of green as they were understood in Renaissance England, including some that foreshadow our paradoxical dependence on and sacrifice of the green world. Ranging across contexts from early modern optics and olfaction to horticulture and herbal health care, this study explores a host of human encounters with the green world: both the impressions we make upon it and those it leaves with us. The first two chapters consider the value placed on two ways of taking green into early modern bodies and minds-by seeing it and breathing it in-while the next two address the manipulation of greenery by Orphic poets and medicinal herbalists as well as grafters and graffiti artists. A final chapter suggests that early modern modes of treating green wounds might point toward a new kind of intertextual ecology of reading and writing. 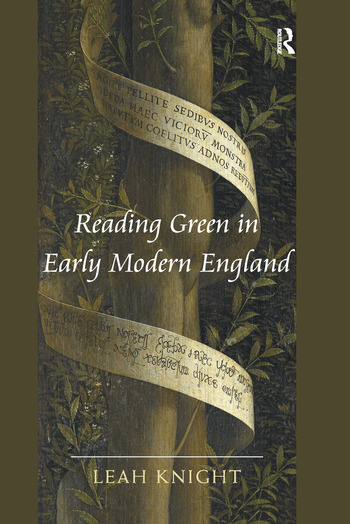 Reading Green in Early Modern England mines many pages from the period - not literally but tropically, metaphorically green - that cultivate a variety of unexpected meanings of green and the atmosphere and powers it exuded in the early modern world. Leah Knight is Associate Professor of English at Brock University, Canada. Her study Of Books and Botany in Early Modern England was the winner of the British Society for Literature and Science (BSLS) Book Prize for 2009.